This beautiful fall hunt photo says it all. Father, son and best friend end the day with a memorable hunt. Fall turkey hunters taking time out for an afternoon pheasant hunt. Pheasants are our most popular and sought after game bird. Explosive take offs, fast running and strong flying make these birds the most challenging to hunt. 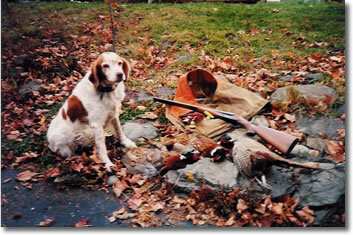 We encourage hunters to bring their own dogs as half the enjoyment is seeing your dog work the birds. 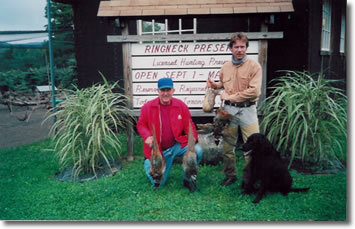 Our dogs and guides are familiar with the terrain and how best to hunt the birds. They are well worth the cost and you will be pleased with the excellent results. 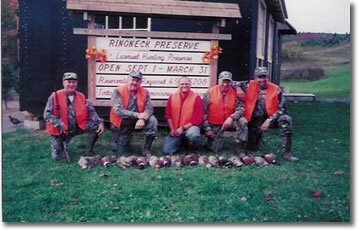 In 20 trips to Ringneck Preserve, I have never had a bad hunt. Ray's birds are strong and smart, the cover is excellent and varied in a classic upstate setting. There is always plenty of elbow room,even with other hunters on the property and you can't complain about the hospitality. You may even get some of Deb's homemade chocolate chip cookies. Pete Mileur, Vestal N.Y.